These are oils which originate from the layers of fat within whole fish. Fish oils are particularly rich in omega 3 fatty acids. These fats are essential for the healthy function of the body. 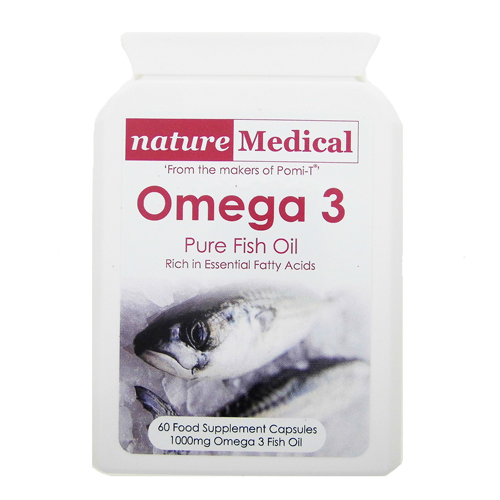 Fish oils are also a good source of the fat-soluble vitamins A, D, E and K.
Rich in the Omega 3 essential fatty acids EPA (Eicosapentaenoic Acid) and DHA (Docosahexaenoic Acid) which contribute to the maintenance of normal blood pressure & triglyceride concentrations. 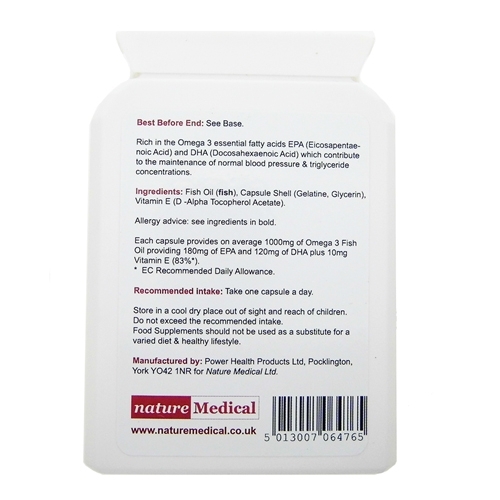 Each capsule provides on average 1000mg of Omega 3 Fish Oil providing 180mg of EPA and 120mg of DHA plus 10mg Vitamin E.
All orders made directly with us are dispatched using the Royal Mail 2nd class service. Most orders are delivered within 5 days but please allow up to 10 working days for delivery. The supplement postal packs are designed to fit through a standard UK letterbox.